Part 2 of the cookie sheet tutorial is coming. How are you doing with them? In the meantime, here's a quick little Valentine idea. I actually made this a few years ago when I helped a friend with her scrapbook store and store blog. It's an idea that can be used again and again though so I thought it was worth sharing. Also, it's got a lot of potential. You can adapt it anyway you'd like to fit your Valentine needs. 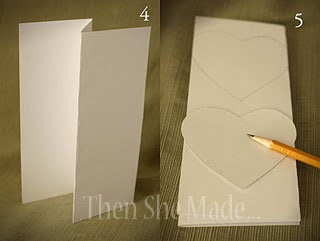 Turn it into a scrapbook album or write a bunch of love notes on it for your kids. It's all good and has a lot of possibilities. 1- Get a little chocolate box and eat the chocolates. You need to make sure that the plastic part that holds the chocolate can come out. I did buy two different types and the other one had the plastic molded in place and would not work. 2- Trace the opening of the BOTTOM INSIDE of the box. 3- Cut out the heart you traced being sure to cut inside of the line. You actually want the heart slightly smaller than what you traced. Set heart aside after it's cut out. 5 - Place heart on top of folded paper. Trace it twice & cut it out. The heart you are tracing will hang slightly over the edges of the paper. 6 & 7 - Once you've cut out your hearts you will have two lines of connecting hearts. Taking the end of one line and the beginning of the other and glue them together so they make one long line - see photo #7. 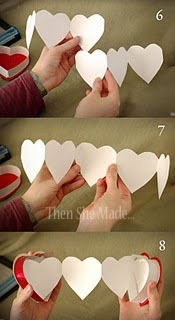 8 - Now that you have one long line of accordion hearts, take your first heart and adhere it to inside of the box cover. Then, take the last heart and glue it to the bottom of the bottom of the box. 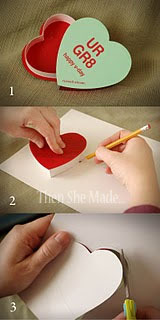 And there you have it, a little heart shaped accordion album that is ready to decorate and give away. Enjoy! And we'll see you tomorrow with part 2 of our cookie sheet calendars. where did you find the heart shaped box of chocolate where the plastic mold came out? ?